In my line of work, it would have been fairly easy for me to simply opt for a top of the range "alpha" bin, but I decided instead to look for something that would be more affordable and thus a good choice to the average person planning a safari or related adventure. 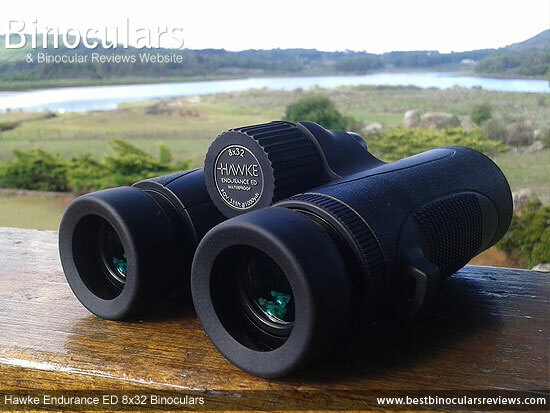 Thus the timing could not have been better when Hawke Sport Optics binoculars contacted me to enquire if I would be interested to try out their new mid-sized, 32mm Endurance ED binoculars. 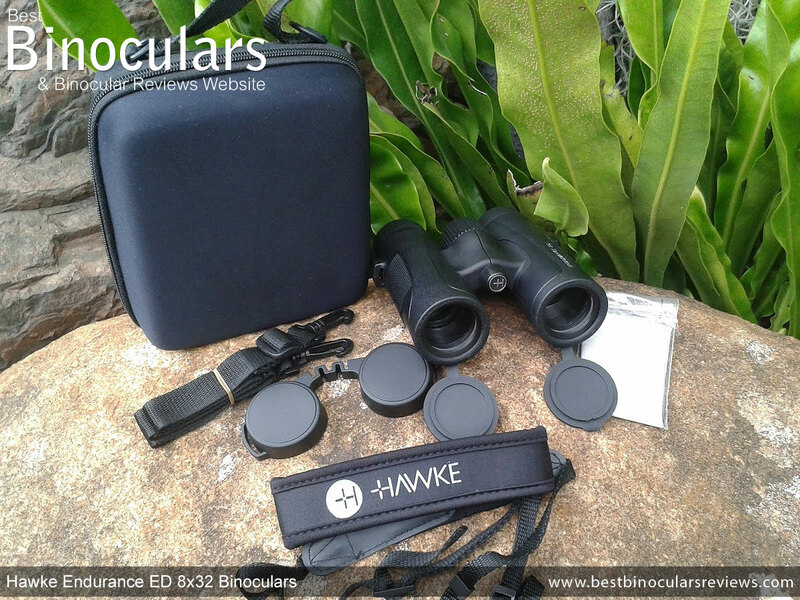 Ranging in price from around $210 to $300 ( £110 / €150 - £290 / €300), the Hawke Endurance series consists of a wide range of binoculars. Indeed there are five different sizes on offer (25mm, 32mm, 42mm, 50mm & 56mm) and each is available in a selection of magnifications (8x, 10x & 12x) as well as color variations (green or black). 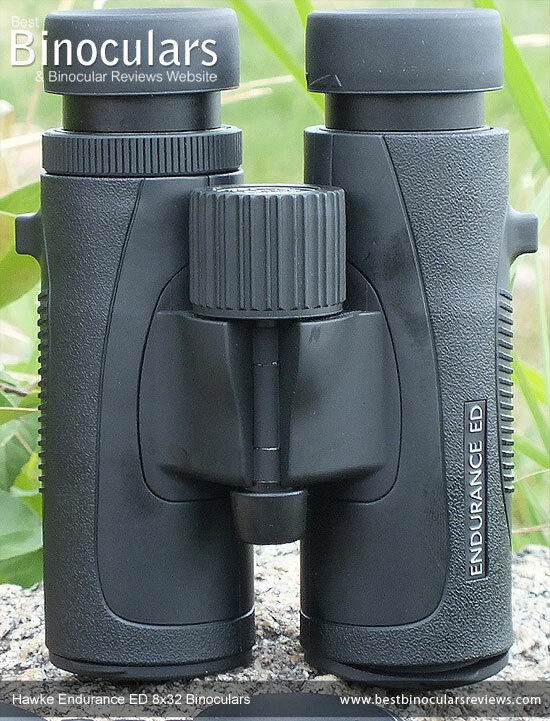 Hawke Sport Optics describe the main shape of these 32mm Endurance ED binoculars as being of a top hinge design, but as you can clearly see that the bridge (hinge) is roughly positioned at the center of the barrels. However on the larger models (42mm and 50mm) the bridge is located far nearer the eyepieces and which is why I think they refer to the whole series as being top hinged. Whatever the case, this single bridge places the large focus wheel on these bins to within easy reaching distance and also leaves much of the barrels free to hold onto for a good grip. As you can see from the image below, the objective lenses on the 8x32 Hawke Endurance ED binoculars are actually placed relatively close (approx. 5mm) to the ends of the barrels. That is to say there is only a minimal inset or overhang as many are set at least double this distance within the ends of the barrels. The advantage of this is that it helps to keep the overall length of the binos down, but with the compromise of having them a little more exposed. 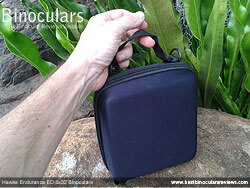 It was good to discover that unlike quite a few other mid sized bins out there, these are still "tripod adaptable. By this I mean that the small dust cap on the front of the central pivot can be unscrewed (see image above). You can then screw a standard tripod adapter into this exposed thread, which then easily connects to your tripod. For more on this, take a look at my section on Tripod Adapters. Almost the entire exterior surface on the Hawke Endurance ED binoculars is covered in a protective rubber coating that is available in either black or a dark green color. Whilst parts of this rubber covering is smooth, Hawke have given it a texture on all the relevant areas to help with grip. Indeed on the sides this texture is very prominent, which not only gives it quite nice finish, but feels good in the hands as well. Hawke Sport Optics have also molded a couple indents into the rubber armor on the underside of the body that are designed for your thumbs. Whilst a very tiny detail, subconsciously these do just enough to encourage you to hold the instrument in the right way and in the correct position for a comfortable as well balanced grip. This in turn makes it easier and more comfortable to hold the bins steady, which results in a shake free image. I was impressed to read that under the rubber exterior, the main chassis is fashioned from a magnesium alloy. I say impressed because at this price point, you are more likely to find bins made from polycarbonate plastic, which is more lightweight, but not as robust and lacks a little in terms the instruments "feel of quality". When you open and close the central hinge, this moves the barrels further and closer together, which in turn also adjusts the distance between the eye-cups. It is in this way that you can adjust the instrument to match your Inter-Pupillary Distance. 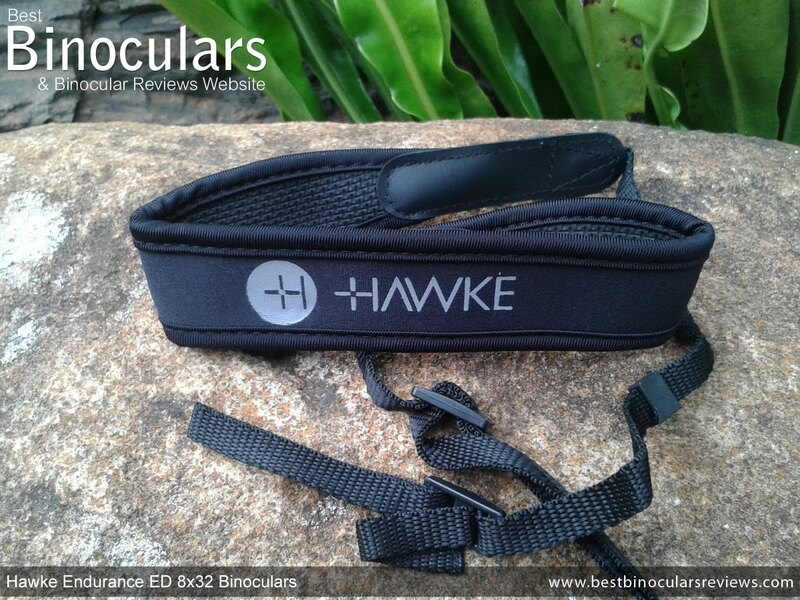 This pair of Hawke binoculars, has a minimum IPD setting of 5.5cm (1.3") and a maximum of 7.6cm (3") which should be enough to cover the needs of most, including older children/teenagers. The twist-up/down eyecups on my sample Hawke 8x32 Endurance ED binoculars worked really well, the action was really smooth and not free play at all. Hawke have also added a fixed stop mid way between the two extremes to help you customise the amount of eye-relief depending on your specific requirements. One point to highlight is that the eyecups on these have an external diameter of 39mm, which is a little larger than I see on many mini-sized bins and matches that on most full sized optics. This combined with the soft rubber covering not only makes for a comfortable cup, but also cuts out more peripheral light for a better view. Note: If you want to completely remove light from entering the sides of the view, I would still recommend using something like these EyeShields that will fit onto these regular sized eyecups with no problem. 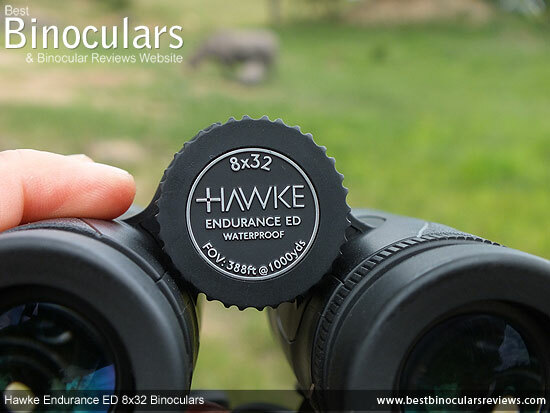 As is clearly demonstrated in the photos above and below, one of the unmistakable features on the Hawke Endurance ED 8x32 Binoculars is the large and really prominent focus wheel. Measuring 31mm in diameter, it is as large as that found on many full sized 42mm binoculars. So whilst this makes for a slightly less compact shape, the advantage is that it is real easy to locate, reach and turn. This is improved even further by adding a ridged rubber track to the exterior which increases grip. For the most part this may seem a little pointless, but if you use them in winter with thick gloves on, it can really help. As with the eyecups, the mechanism was nice and smooth and on my sample had no free play in any direction at all. Taking two full rotations (720°) of the wheel to go from near to far focus, I would describe gearing on the focus mechanism as being quite low as quite a few will take less turning to achieve the same result. The advantage of this is that it in theory makes it easier to make very fine focus adjustments, but also takes you a little longer to make large adjustments. My experience was good in that both fine tuning the wheel to get a pin sharp focus was both simple and quick to achieve and I never had the thought that it was taking too long to make large adjustments. 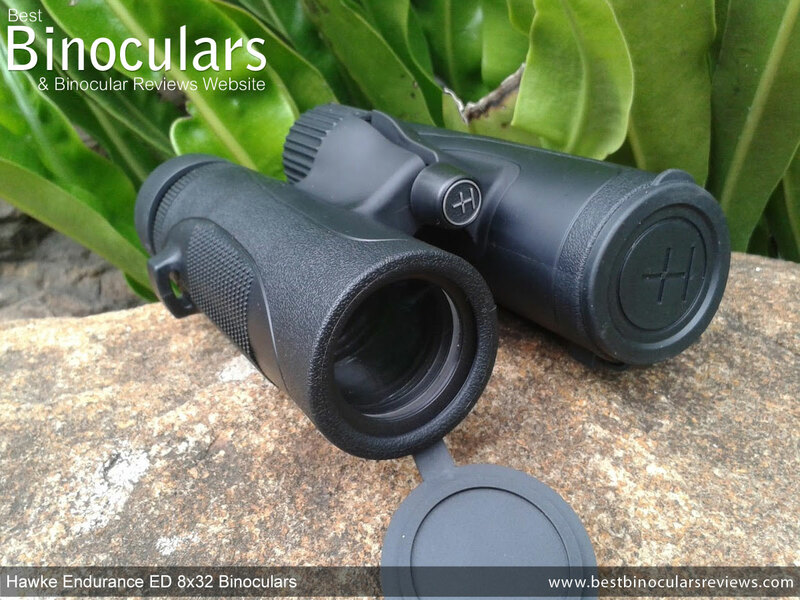 To counteract any differences in the vision between your right and left eyes, these Hawke's (like most good bins) have a diopter adjustment that enables you to set the focus of one side of the binocular independently to the other. 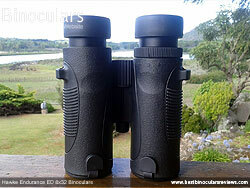 In this way you can calibrate the binoculars to suit your particular vision. The diopter adjustment on these Hawke Endurance binoculars is located in the usual location near the right eye-piece and is adjusted by turning the ring. The best ones are lockable so that any unwanted alteration of your setting is almost impossible, however there was enough resistance to movement on my sample to make any accidental movement reasonably unlikely. As you can also see from the table above, apart from a few very compact designs, these 8x32 Hawke Endurance ED's are pretty typical when it comes to their dimensions in comparison to most other mid-sized bins. 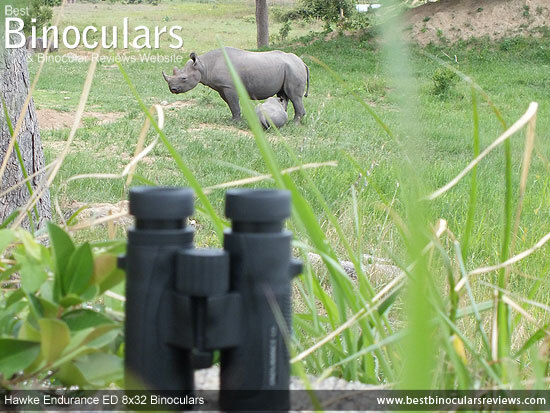 As is eluded to in their name, the 32mm objective lenses on this binocular has an element which is made from ED (Extra Low Dispersion) glass. As is demonstrated by the image below, the properties of ED glass potentially enable a sharper, higher resolution image with less color fringing to be produced when compared to standard glass. This is because it provides more options for the better manipulation of the individual wavelengths of light, so that they can be more accurately be focused onto the same place after exiting the lens compared to standard glass. However it must be stressed that the simple inclusion of ED glass does not guarantee a better result, as it still requires a high level of expertise and technical know how to manufacture an optical system to perform optimally. Indeed I have reviewed a number of very well designed non ED glass binoculars that in my opinion outperform lesser quality ED instruments. Also well worth mentioning is the fact that these mid-sized 32mm bins have ocular lenses that I measured to be 21mm in diameter, which is considerably larger than that which I find on many other similar sized binoculars and indeed equals that of most full sized binoculars. In fact I would not be surprised to discover that these use exactly the same eyepieces as that of the 42mm versions. These and indeed all instruments in the Endurance series from Hawke use roof prisms to correct the inverted image, which does mean that a compact shape of binocular is possible to produce, but they do require to be treated with some special coatings (see below) in order for them to equal the performance of a porro prism made from the same quality of glass. 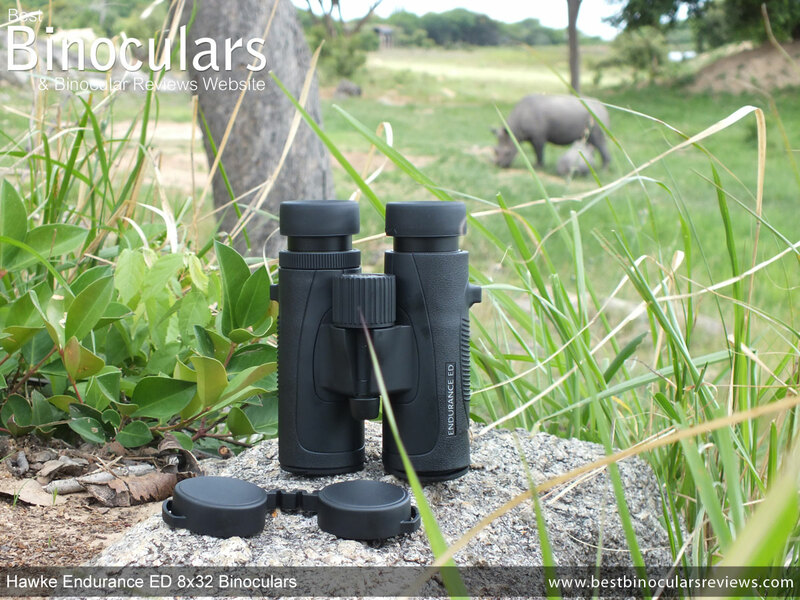 Speaking of which, Hawke Sport Optics highlight the fact that their prisms are made from BaK-4 glass, which is good news as it is the preferred choice for the use in binoculars. 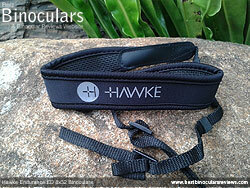 These and indeed all Hawke Endurance binoculars are described as being fully multi-coated. This is great news as it means every single exterior glass surface within the entire optical pathway on these bins has had multiple coatings of an anti-reflection material applied to them. The result of this is that more light passes through the system and in the correct way, which in turn produces a noticeably brighter and better quality image (when compared to those with fewer coatings). 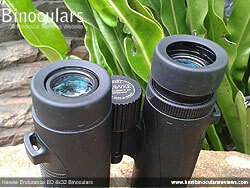 Also important is the fact that the roof prisms in these Hawke binoculars have been phase corrected. You can read more on this treatment in my article on Phase Correction in Binoculars, but it essentially means that a higher contrasting and better image resolution is possible than when compared to those that are not treated. The 4mm exit pupil (32÷8) produced by 8x32 binoculars may not quite match that of the 5.25mm exit pupil on an 8x42 binocular, but it is still plenty large enough for them to pass on enough light to your eyes for you to see a bright enough image in all but the very poorest conditions. The view you see through the 8x32 Hawke Endurance ED is 388ft wide when measured at a distance of 1,000 yards away (129m at 1,000 meters) which I would describe as being reasonably wide and perfectly fine, but as you can see below it is statistically a little less than some of the widest 8x mid-sized bins out there. 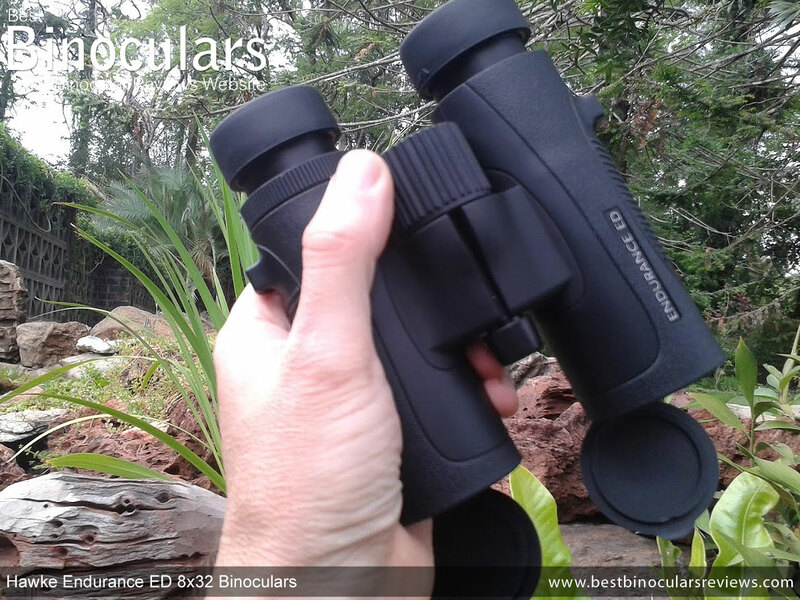 However unless you specifically require an extremely wide FOV, I really would not worry at all as I never once thought when looking through them that I needed or wanted a wider view and I spent a lot of time using these for observing birds whilst on safari. 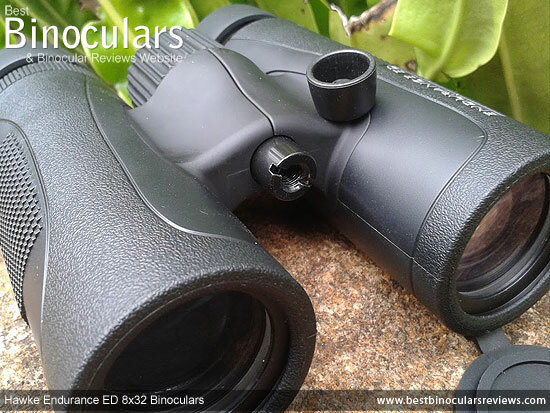 At 6.6ft, the minimum focusing distance of the Hawke Endurance 8x32 ED binoculars falls just short of excellent for this size class. So whilst they may not be the ideal choice for specifically viewing things like butterflies and flowers from close ranges, they are perfectly fine for occasionally doing so. Those who wear glasses usually require at least 14mm to 15mm of eye-relief to be able to keep their glasses on and still see the full width of the image when looking through a pair of bins. 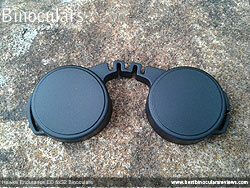 Thus with 18mm, I describe these as having a long eye-relief , making them perfect for those who do wear glasses. In good ambient lighting conditions, I really was not able to differentiate any change in brightness between these and either of the 8x42's that I was comparing them against. Then even in what I would describe as being quite poor light during the late afternoon and early evening, the difference in terms of image brightness was really not obvious between these and the larger sized optics. Indeed it really was only in very poor conditions that the larger exit pupil on the 42mm binoculars made the difference to the brightness of the image that you perceive. In a good pair of optics with high quality glass and coatings, this is to be expected and I would say that these are as good as any mid sized binoculars with objectives of around 32mm at this price range in this area. The image as a whole and in most conditions to me looked bright, but without being washed out. I also thought that the colors were nice and vivid, but without looking unrealistic or with too much contrast. Thus my description of the view would be natural and without any noticeable tinting that I sometimes observe. As a result of chromatic aberrations, even the very best bins show some level of color fringing if you look hard enough. So whilst there was some fringing on the Hawke Endurance ED 8x32 binoculars I tested, I had to really look for it and it really was no more than I would expect to see on a high end binocular and less than what I would expect to see in this price range. Image softening right at the edges of the view was extremely minimal and no more than what you would expect to see on the best. At no time during my testing or using of these Hawke binoculars did I ever become aware of any obvious image distortions which can make the image look like it not flat and is either curving outwards or in on itself. 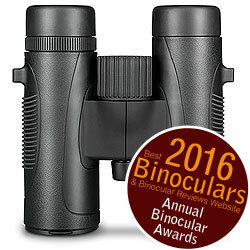 For a 8x32mm binocular I thought that the image was about as bright as you could hope for and the overall image quality was excellent nand easily a match for any within it's price range. I really like the semirigid carry case that comes supplied with this Hawke Endurance ED binocular. Indeed it is very similar in design to the ones that you get on the very high quality and far more expensive Snypex Knight ED Binoculars. Not only does the more rigid structure of the case offer far more protection than most that come with soft cases, but I find that they fit very well inside (even with the eyecups fully twisted out and the lens covers on which makes it very easy to take them out and replace them. The full length Zip also makes for a far more secure closure than those that only have a strip of Velcro or magnetic clip. Internally there is a separate meshed pocket that can be Zipped closed and is thus not only a great place for keeping things like your cleaning cloth, but can be used to securely store your keys or some money whilst you are out in the field. The case comes with it's own un-padded shoulder strap that can quickly removed as it connects to the bag via a couple of quick release clips. On top of this the case also has it's own hand strap, which is a feature that I really like. Made from a Neoprene type of material, the main padded section of the neck strap may not be quite as classy as that which you find on some higher end optics, but it is very comfortable and generally better than most in this class. The general stitching looks very good and the connectors that fix the padded section to the thinner nylon straps looked to be very secure and well made on my sample. The strap fixes to the instrument in the usual way by threading each end through the eyelets on the sides of the barrels and then back on themselves and through the sliders which enable you to alter the length of the strap to your needs. Not only do they fit into the ends of the barrels as opposed to over them as on most, which looks far neater, but I also far prefer the way that they have been tethered to the binocular. Most have a simple rubber loop that fixes around the barrel, which works well enough, but once again looks like an afterthought and far more clumsy than the purposely designed fixing points on the underside of the Endurance ED. The Hawke eye piece cover (rain-guard) is pretty standard and on a par with the better ones you can expect to find. I say this because it fits well over the eye-cups and has a flexible bridge between the cups so that they can fit onto the bins, no matter what you have set your IPD at. The included cleaning cloth is of a reasonable quality and whilst not the best, it is on a par with the better ones within this price range. So as with almost every binocular, I highly recommend that you get yourself a decent lens cleaning kit to properly clean the lenses without the risk of marking them. 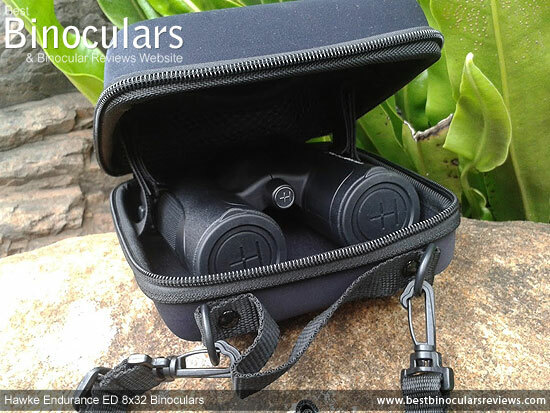 As with all their binoculars and spotting scopes, the Hawke Endurance ED 8x32 binoculars comes with their World Wide Lifetime Warranty (The warranty is legally limited to 10 years within Europe.) which is excellent. For my safari trip, these were a fantastic pair of binoculars. Small enough to make them easy to pack away and carry about, but also large enough for them to deliver a high quality and bright image for use in all conditions and times of the day. Strong Points: At this price level, the build quality is impressive. 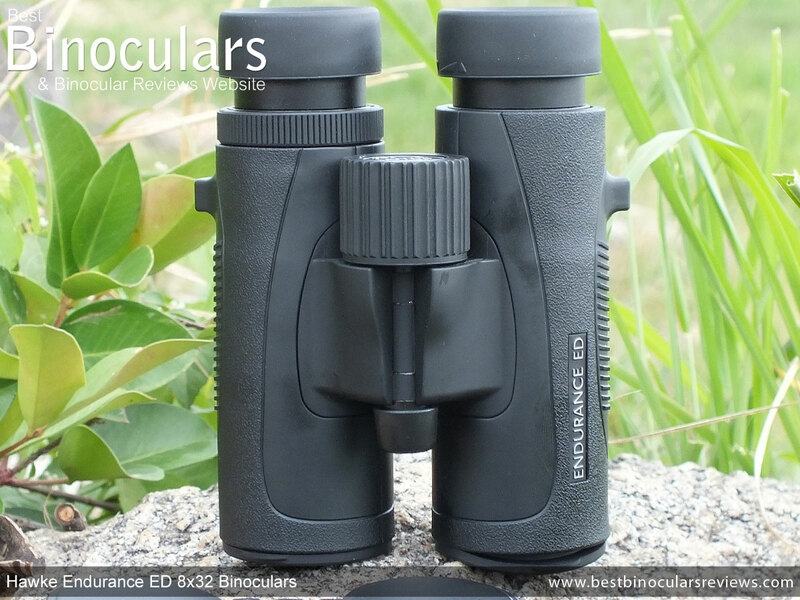 Right from the unseen magnesium chassis, to the quality of the exterior armour and other touches like the flush fitting lens covers all add up to ensure that the Hawke Endurance ED 8x32 binocular looks and feels a lot more expensive than it's price tag would suggest. The quality of glass used and their coatings is about as good as you are ever going to see within this mid-level price range, which by itself is impressive. However more importantly this translates to what I would consider to be a very high quality image for a 32mm binocular and one that you would really struggle to beat... at almost any price. I also really like most of the included extras/accessories. The semi-rigid carry case is in particular far better than any others in their class and the objective lens covers are as good as any out there. The field of view, minimum close focus and amount of eye-relief, whilst not class leading, are all very good to excellent and that is indeed a strong point. It is a difficult balancing act, make one better and you are most likely going to sacrifice another and so to have them all up there is something to appreciate. You also can't argue against the lifetime warranty (especially on a lower costing device), which in my eyes is a clear demonstration as to the faith that Hawke have in the product. Weak points? I found absolutely no major weaknesses on these that I would be concerned about. Indeed I am struggling to think of any weaknesses to highlight. Sure there may be some that hope for a slightly wider FOV or perhaps a closer minimum focus, but then it would only be for specialist reasons and as I have pointed out, if you were to improve on one of these you would most likely sacrifice another. I could perhaps also say with some certainly that because Hawke Sport Optics don't highlight what reflective coatings are used on the prism, means that they most probably don't use the very best Dielectric coatings, but then at this price almost none will. So whilst they may not quite match the very best, I cannot say it is a weakness when you compare them against others within their price category.